Globalisation in the art market may be slowing down according to an article published recently in The Economist. In spite of the growing numbers of artists and buyers from locales ranging from Africa to Asia, May sales in New York were dominated by American artists. “At the Christie’s sale, the first of the two main evening auctions, three-quarters of the buyers were American”. With the prices of work by top Asian artists still lagging behind big-name American contemporaries, it may not come as a surprise that Asian artists are sometimes underrepresented in main and evening sales abroad. That is not to say that Asian artists do not fair well in Asian markets. In Artprice’s Top 100 Hammer Price List, only seven Asian artists crack the top 50. Not surprisingly, all were Chinese artists with sales in Beijing or Hong Kong. Numbers such as these suggest that there is still some preference for homegrown artists. Even so, the unusual dominance of American artists at Christie’s New York sales this past spring did not go unnoticed. We at Art Radar Asia wonder if this is really so surprising? There are few Post War Asian artists represented in these sales because Asian artists have only received attention in the last twenty years. For contemporary artists it is a different matter. While there is no doubt that some Asian artists, and those from other emerging countries, are now well known, their prices still lag behind those of top contemporary American artists. And, of course, main sales, and evening sales in particular, feature only the very best, usually most expensive, works. Dinesh Vazirani is the CEO and Co-Founder of Saffronart, the world’s largest online auction house for fine art and jewelry. In the Podcast interview with ArtTactic, he reviewed the performance of the Indian art market in 2009. He also shared his observations on the changes in the Indian art market in the recent year. Moreover, he shared part of his formula of success in running an online auction platform of such scale. How was the performance of the Indian Art Market in 2009? To what extent has the Indian Art Market recovered from the financial crisis in 2009? A lot of changes happened in the post financial crisis period. The initial six months was a difficult time for the art market. The base of the investors and collectors changed quite dramatically. Investors and speculators that are active in the post financial crisis disappeared from the market. There are real collectors looking for good value and premium quality. In the later part of the year with the Indian economy getting better, confidence and perception changed. We saw some of the collector base come by and want to buy the best of the best. In the early part of the year, prices of modern art retreated by around 30-50% and contemporary art by 50-80%. Modern art prices recovered by 15-30% later in the year and contemporary art came back by 10-15%. In 2009, the Indian market underwent a transitional change. The players changed. Some galleries and auction houses shut down and some opened. How is the heavy presence of speculators a threat to the sustainability of the Indian Art Market? Speculators come into the market and drive up the prices. In 2005 to 2008, prices rose dramatically which brought in a whole slew of speculators, investors, private dealers, collectors and funds. In 2009, after the financial crisis, these players disappeared but they will come back if the value is right. However, it is not expected that they would be jumping into the market as fast as in 2005. This downturn in Indian Art is the first ever downturn in the history of Indian art. Most people have not gone through a downturn to understand the implications of it. What pattern has been developed in the collector base? The previous collectors of Indian Art are large corporate houses and business houses in the India subcontinent. However, in the last five years, the collector based has moved from a business house concentrated end towards a broader collector base, which constitutes a lot of professionals, younger collectors from the finance field and young business people. Interestingly, some are from outside of India. In 2006, more non-Indians collected Indian contemporary art and wanted it as a cultural bridge. 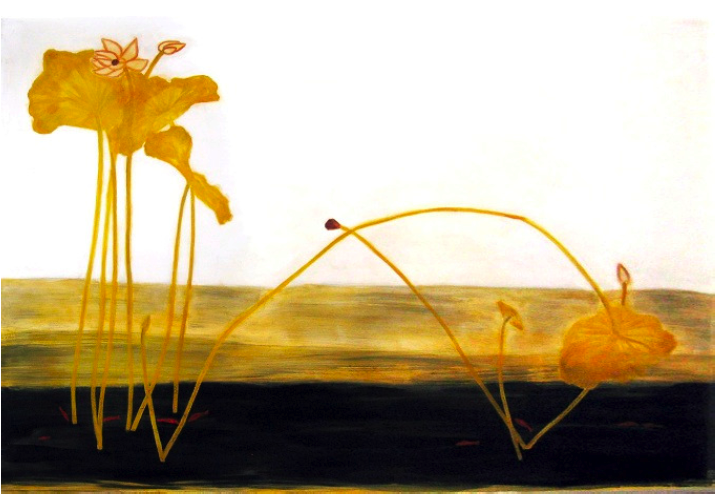 What is your outlook for the Indian art market in 2010? Players will be coming back to purchase work and a new base of buyers are expected too. There were people wanting to come in to buy during 2005 to 2008, but the price rose too sharply then, so they want to come in now and see if they can get premium values. 2010 will be dependent on two things. One is the perception and confidence of the Indian base customers and the other is the participation of non-Indian buyers in the post finance crisis period in the art market. Why has Saffronart been so successful as an online auction house when no auction houses have found equal success in this format? For the past 10 years, we have been building up the collector base, giving them the confidence and transparency and improving the technological platform. On the other side, we have been doing physical exhibitions and previews all around the world, including San Francisco, L.A., Mumbai, New Dehli, Hong Kong and London. To make people confident, we added the brick and mortar side. 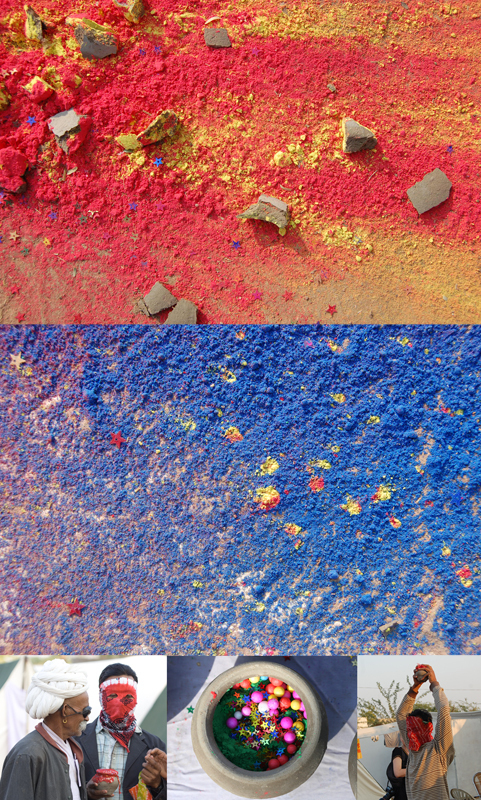 It is the “the click and the brick” that has made Saffronart so successful. Nearly every business is heading to the direction of going online. Is the art market fundamentally changing because of the web? Over time, there will be a strong shift towards online transactions. People will transact more online or even leaning more to mobile bidding platforms. These mobile bidding platforms have been enormously successful. To listen to the original Podcast, please click here. Arttactic has a range of fascinating interviews with art market influencers and is worth a browse. The first edition of a new and unprecedented artists’ workshop in Rajasthan brings together traditional rural artists and urban international contemporary artists for approximately 12-14 days to create art and exchange ideas. This project, called ‘Sowing Seeds’ (in Indian, ‘Beej Bonna’) is an interactive artists’ workshop and is to be held annually in an Indian countryside village every December with the aim of facilitating the ‘rise of a new era’ in Indian visual art. The 2009 ‘Sowing Seeds‘ program became a reality after six years of hard work, and plans for the December 2010 workshop are already underway. Art Radar catches up with the lead organizer of the programme, Mr. Vagaram Choudhary, to learn more. Why did the camp start, and what is it intended to achieve? What are the main objectives of ‘Sowing Seeds’? Corina Gertz, from Germany. Created during Sowing Seeds 2009. Is the program associated with a gallery? How are participating artists chosen? Do the artists create art individually, or in groups? What are the future plans for the programme? Aditi A. Kulkarni, from India. Created during Sowing Seeds 2009. When and where is Sowing Seeds 2010, and how many participants will be invited? Rajesh Pullarwar, from India. 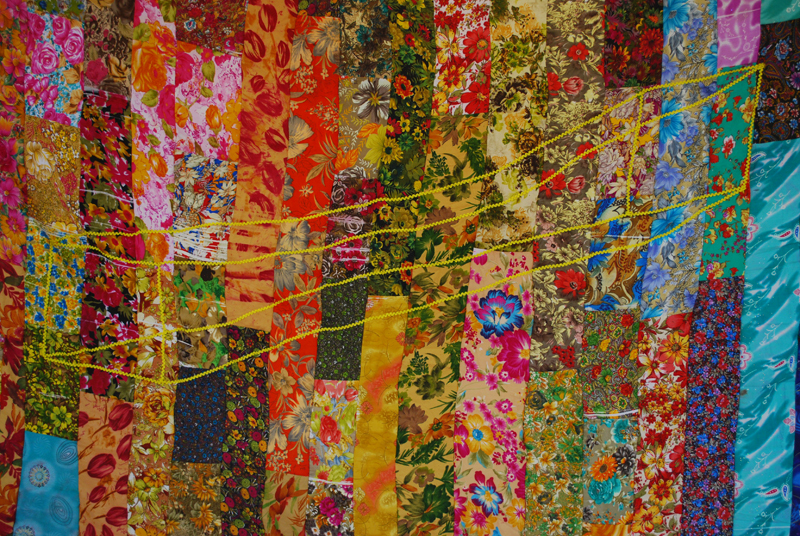 Created during Sowing Seeds 2009.
Who were the participating artists in 2009, and where were they from? Can you describe the activities that artists participate in while completing the workshop? Interested parties are encouraged to contact Mr. Vagaram Choudhary and check out Sowing Seeds for more information on this intercultural arts program. China wants its own version of Hollywood. An intriguing article in the Toronto Star examines China’s growing recognition that media and culture can be a powerful tool to spread political, social and economic ideologies beyond its borders much in the manner of the USA’s film industry. The economic revolution in China began thirty years ago. Back then, there was nowhere to create or exhibit art works and the Chinese government hardly had time to think about art and international cultural standing. China was opened up to Western investment and the country has since surged toward becoming the world’s second largest economy. Now, China has begun to realise the power that can be gained by having a successful cultural industry. China is seeking the benefits of what it calls developing its “soft power”. The country has spent many years creating a booming primary and secondary industry and as a result has spent little time focussing on becoming a cultural world entity. Considering China’s significant history in contributing to world culture in centuries past it is now seeing the value in developing its cultural identity again. China is opening itself up to the international art circuit and some of its artists are gaining widespread popularity and success. The government is trying to use the arts to disseminate its political views to the world. China’s political administration increasingly views cultural production as a valuable tool for building a strong nation and is rapidly pouring millions of dollars of government money into this sector as well as opening it up for private investment. 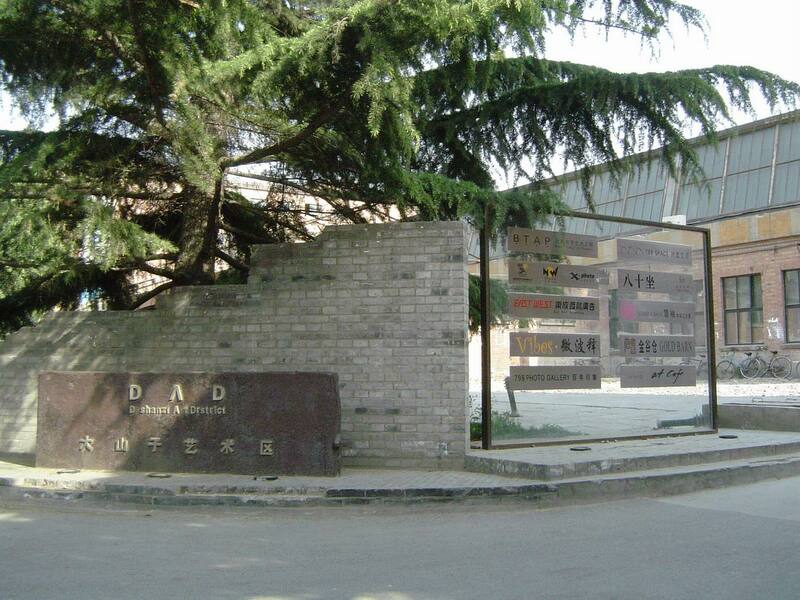 Many developments have been occurring over the years where old factories and former industrial areas are being rejuvenated by the government as new “art villages”, such as Beijing’s 798 Art District. These places consist of clusters of artist studios and galleries where art can be produced, viewed and sold. While there may be a move by the government to celebrate local cultural achievements on a world scale, they still want to have control over the ideologies being expressed. However, more widespread access to and use of the Internet and digital cameras has allowed distribution of Chinese art works that critique party ideals. It seems China’s political powers hold an increasingly modern and accepting view in terms of developing the country’s cultural domain. However, even China’s most celebrated artists are finding that they still must toe the ideological line in order to continue to produce their work. There is a dark side to this cultural push and many artists have found out the hard way what happens to those who challenge the government of China. 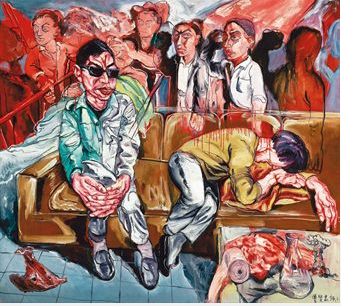 This is a summary of How China is using art (and artists) to sell itself to the world (Murray White, Toronto Star). Way to Rome, by Said Atabekov, 2007. Lambda print on dibond. Uzbekistan. Every industry has its gatekeepers, and the art world is no exception. In the complex world of identifying and valuing cultural and artistic significance, it is the curator who filters through the ‘noise’ to uncover the hidden gems that are relevant, and then presents that information in a meaningful and understandable way. One may wonder how a curator becomes such an authority, worthy of deciding what fine art demands to be seen, and what does not. The engaged art enthusiast simply must know: who are these internationally active contemporary art curators, and what can they teach us? Art Radar Asia catches up with Rosa Maria Falvo, an independent Italian-Australian based curator whose most recent project was the East of Nowhere show in Turin, Italy, which showcased artworks from Central Asia. She sheds light on the intriguing world of multicultural curatorship, the rising international interest in artworks from the likes of Afghanistan, Kazakhstan, and Kyrgyzstan, and, most importantly– why Central Asian art is emerging onto the world scene now. Where did you grow up and where were you educated? RMF: I grew up in Melbourne, Australia, graduating with Honours in English literature at Monash University, majoring in theatre, psychology and sociology, and then completing a Diploma of Education. I have done various post graduate studies in Italy on language, art and culture, specialising in photography, cinema, and the 20th century avant-gardes. Has this had any influence on your career in art, or your response to art? RMF: I enjoy investigating differences and then looking for natural similarities. 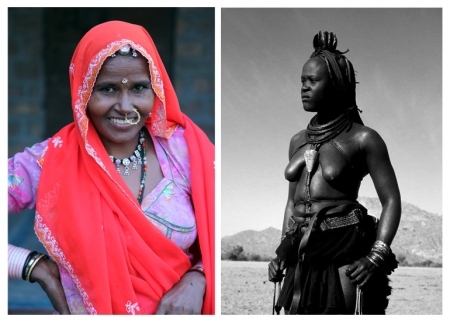 In the last 5 years I’ve really focused my curatorial thinking on the East–West dichotomy. My Italian-Australian heritage has nurtured my open appreciation and desire for aesthetic and cultural reference points. I feel very fortunate to have this twofold awareness, which has given me unique insights and provides the foundation for my work. Since 2000 I’ve been involved in promoting individual artists, designing exhibitions and contributing to publishing projects. As an independent writer, translator and curator I’ve established a fruitful international network. RMF: With dual citizenship, I live and work in both Italy and Australia, and travel regularly to various parts of Asia. I do overland trips for long periods, such as throughout Myanmar, Pakistan, India, Bangladesh, Nepal, Kazakhstan, Tibet, Mongolia, and Western China, meeting artists and collecting their work. These journeys are both personal and professional odysseys. I am the Asia-Pacific Publications & Projects Consultant for SKIRA International Publishing in Milan-Paris-NY. This involves establishing publishing and exhibition projects with major public and private museums, galleries, and artists throughout the Asia-Pacific Region. Which cultures do you have a deep interest in or connection to? RMF: I am deeply connected to Italy and also feel an affinity for Central Asia and the Indian subcontinent, particularly Pakistan and India, given the many friends I’ve made and the cultural treasures I’ve experienced. What types of art have you worked with in the past? Why those? RMF: I’ve worked with Italian, Australian and Asian contemporary artists: sculptors, photographers, painters and designers. I admire those who remain true to their own vision while mastering the technical excellence of their craft. How successfully they link the two is for me an indication of quality work, which is by definition powerful. Good artists are important cultural translators and visual conversationalists. Do you collect art? If so, what is the most recent artwork you have bought? RMF: I collect work on my travels, pieces that appeal to me aesthetically and intellectually. I take an interest in artists as people, and I like to know as much about their creative process and psychological view as possible. 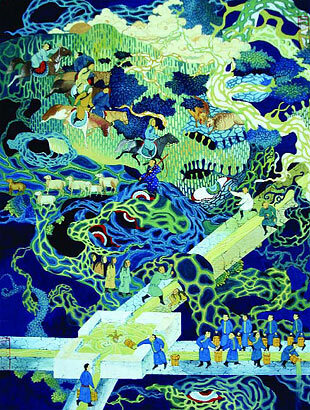 The most recent works I have collected are by Adeel uz Zafar, a talented Pakistani painter and illustrator, working with notions of the larger-than-life canvas of life, and Uuriintuya Dagvasambuu, an emerging Mongolian painter who reworks the traditional Mongol zurag technique into contemporary themes. Have you noticed a rising interest in Central Asian art? RMF: There’s a rising interest in Central Asian art, because there’s tremendous shifting in this part of the world’s geopolitical and cultural realities. Pakistan, Afghanistan, and the ex-Soviet republics are pulling and pushing at an amazing speed. There’s growing curiosity from those who know very little besides what is shown on TV and ever deepening analysis from those who have long been aware and well travelled. The allure of ethnicity, exoticism and culture shock is often a visual pretext for the real essence of a show like this, which is to present an account of the changing face of contemporary Central Asia. This international awareness is recent if you consider that the first Central Asia pavilion took place at the 51st Venice Biennale in 2005, where newly established post-Soviet states Kazakhstan (with artists Khalfin, Maslov, Meldibekov, Menlibaeva, Tikhonova, Vorobyeva, Vorobyev), Kyrgyzstan (Boronilov, Djumaliev, Kasmalieva, Maskalev) and Uzbekistan (Akhunov, Atabekov, Nikolaev, and Tichina) represented a “regional group” curated by a Russian, Viktor Misiano. This heralded the development of the Central Asian art scene. Emerging from a monolithic Soviet Union we see extraordinary complexity and fermentation on issues to do with struggle, conflict, and identity. That a place like Afghanistan nurtures its own contemporary art scene, however fledgling, is testimony to the unflagging spirit of special individuals dedicated to the arts. Rahraw Omarzad’s ‘Closed Door’ video provides a playfully eloquent metaphor for the obstacles facing ordinary Afghanis in the context of violence and corruption. Have there been many Central Asian art shows, or was East of Nowhere introducing completely unseen art to Italy? RMF: There have been few initiatives on Central Asian art outside Central Asia. ‘East of Nowhere’ was a natural and ambitious outgrowth of a previous premiere show entitled The Tamerlane Syndrome: Art and Conflicts in Central Asia in Orvieto, Italy (2005), curated by my expert colleagues, Enrico Mascelloni and Valeria Ibraeva, who each have 30 years of experience in this region of the world. Men Praying on the Central Square in Bishkek, by Alimjan Jorobaev. RMF: We’ve had very positive responses. This industrial area of Turin – Via Sansovino- is being redeveloped by Fondazione 107. Visitors have made a real effort to seek out this show and been impressed with the space, which is a beautifully reconverted warehouse. The variety of work and line up of both important and emerging artists has excited Italian and European media, which have been particularly complimentary; commenting on the panorama of talent and the contextual analysis of multiple narratives. RMF: I think a successful exhibition stimulates questions from those who were otherwise unaware of what is out there and raises the quality of debate amongst those who do. Obviously, once there is growing public interest the art system brings the process of monetising art. Prices have certainly risen and it’s very interesting to watch what is happening in this part of the world. What excites me is the open, honest and often young creative energy that has no direct dependence on a predetermined art market. What themes do you see within Central Asian art, and why are they capturing the imagination of an Italian audience? RMF: East of Nowhere offers a daring mix of impressions about a ‘Greater Central Asia’: accelerating globalization, contemporary nomadism, and pre-Soviet and Islamic traditions. 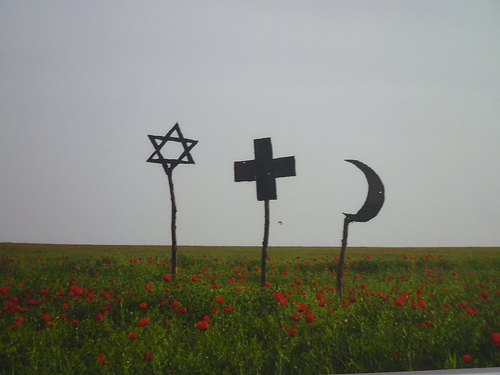 These 32 artists from Kazakhstan, Kyrgyzstan, Uzbekistan, Tajikistan, Turkmenistan, Afghanistan and Mongolia take us beyond borders (which are not just arbitrarily reshaped, but often draw a blank in the minds of Westerns), violence, and Hollywood, into a new awareness of post-Soviet experience and ethnic affinities. Said Atabekov’s Way to Rome, which is the cover image of our exhibition catalogue, recalls Marco Polo’s journey through Central Asia as the epitome of East-West encounters. For this photographic series Atabekov travelled throughout Kazakhstan, capturing daily life and landscapes, documenting the emblems of tradition and transformation. Of course, his work is also an ironic play on the ‘Path to Europe 2009-2011’ announced by Nursultan Nazarbayev in his presidential address to the people of Kazakhstan in 2008, which outlines his foreign policy for developing multilateral strategic cooperation with Europe in technology, power engineering, transport, trade, and investment. This promotion of Kazakh ‘prosperity’ highlights the paradoxical relations between Central Asia and Europe. 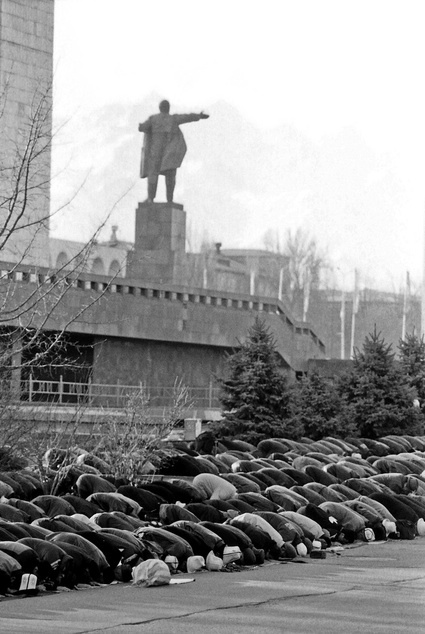 Alimjan Jorobaev’s Men Praying on the Central Square in Bishkek shows people praying with their backs to a sculpture exalting Lenin. Issues on collectivism, religion, identity politics, and nationhood are universal concerns, but they are in particularly sharp focus in this region of the world. I’m pleased to say that Fondazione 107 in Turin will continue to present projects based on the legacy of pioneering artists, curators, and collectors. The May 2010 incarnation ART HK will only be the international art fair’s third event, but it has already earned the confidence-and sponsorship- of Deutsche Bank, the largest bank in Germany, which has recently signed a 5 year sponsorship deal with the young but promising Hong Kong art fair. Their enthusiasm for the fledging fair is understandable; ART INFO reports that in May 2009 (an uncertain time for art!) 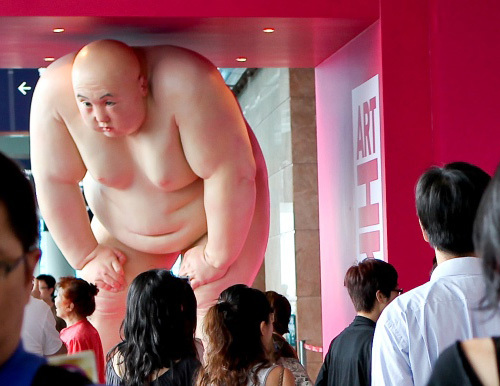 27,856 people visited ART HK over four and a half days to view 110 galleries from 24 countries. In all, this accounts for a 31% jump in attendance over the inaugural fair in 2008. Deutsche Bank is a well known patron of the arts, and controls one of the world’s largest corporate contemporary art collections, which is comprised of about 50,000 artworks from the 20th century. With the motto “Art Works,” the bank has maintained a pro-art agenda for the past three decades, making these artworks accessible to the public worldwide. It also collaborates with the Solomon R. Guggenheim Foundation on the Deutsche Guggenheim in Berlin.